This weekend, WMDF expands to its fullest size, with the main WMDF festival running alongside both MoguFes and WakuFes for the entire weekend. Many artists from all over the world will be performing, for example America, India, Lithuania, Bangladesh, and Ukraine. 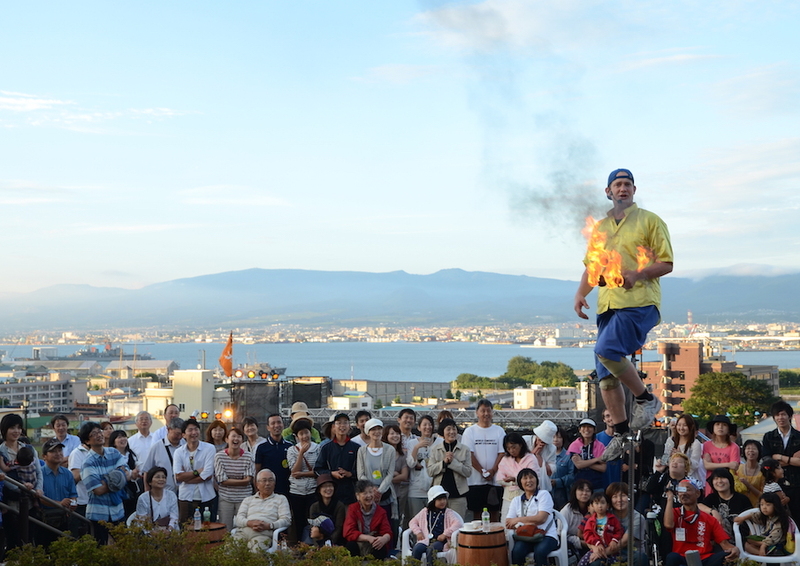 We also bring you a huge variety of many genres of Japanese performers. The weather is great, so come down and enjoy the performances in the Park, while trying out the foreign foods and drinks! Today’s post marks 33 days to go until the start of this year’s WMDF. We hope you have enjoyed our lineup taster of the international group profiles announced so far. Please check back next week, when we will be posting over thirty profiles in English and Japanese on our artists page! Originally from the farm community of Knightstown, Indiana in the United States, Brian began his professional performing career as a comedy juggler in 1986 at the age of seventeen. Since then, he has performed throughout the United States and around the world. Brian has become a stalwart supporter of WMDF, sharing both his awesome performances and his in-depth production knowledge. We are grateful for both. This year, Lithuania marked the 25th anniversary of its declaration of independence from the Soviet Union (it was the first Soviet republic to declare independence). WMDF is happy that we can help to spread the celebrations to Japan! This folk dance ensemble has a history stretching back to 1978, and took the title “Grandinele” in 1992. This name means “chain”, which illustrates the group’s philosophy of never-ending youth: dancers join “Grandinele” as little kids; they grow up with traditional dances and music; then they help to teach the new kids that have joined. In this way, each generation continues the traditions of their fore-runners and also creates their own new ones. The Ensemble “Grandinele” represents the northern region of Lithuania and dances Lithuanian folk dances, roundelays, games and also the newest folk stage compositions. They have an impressive record of performing in many countries around the world; WMDF hopes they will create many new traditions with us, on their first ever appearance in Japan.